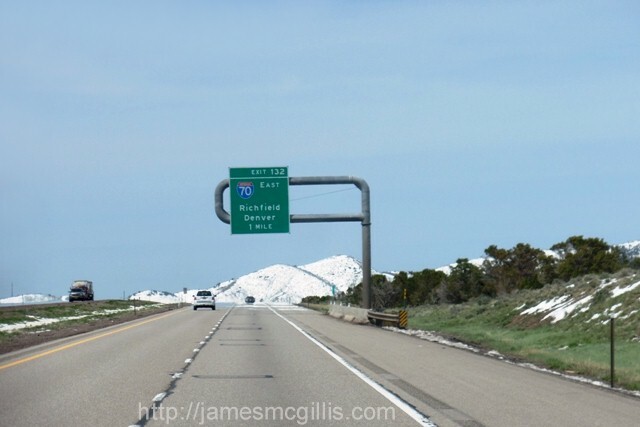 In May 2014, I departed Mesquite, Nevada, heading for Moab, Utah, 375 miles to the northeast. Normally, it is an easy trip north on Interstate I-15 and then East on I-70. At Crescent Junction, I would hit U.S. 191, and then head south toward Moab. According to Google Maps, the highway trip should take five hours and thirty minutes. Since I was pulling our Springdale travel trailer, I added two hours to the estimate. Near its start at Cove Fort, Utah, I-70 traverses parts of both the Fish Lake National Forest and the Manti La Sal National Forest. 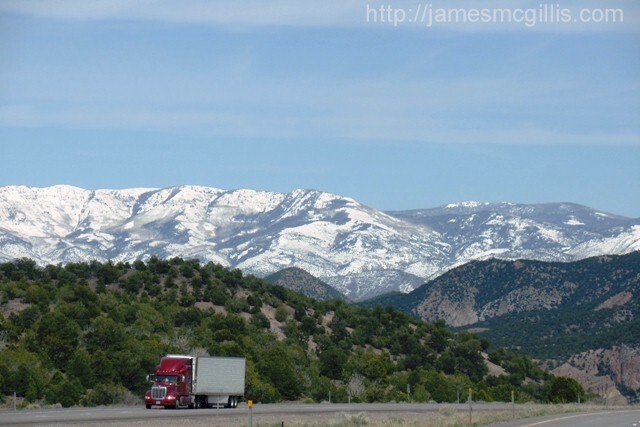 Along that route, the mountain passes exceed 7,250 feet elevation. After transiting through both national forests, I-70 presents itself as a slow-motion rollercoaster ride. The culmination is a twisting descent down the east side of the San Rafael Swell. Combined, my Nissan Titan truck and its trailer weigh 11,000 pounds. With a twenty percent horsepower-loss at 7,250 feet, the 5.6 liter V-8 in my pickup was averaging just over six miles per gallon. The only way to go faster was to downshift into second gear while ascending. At that throttle setting, the engine runs at over 5,000 RPM, increasing both gasoline consumption and engine wear. The only sensible solution was to slow down and not push my rig so hard. In doing so, I finessed the gears, rather than the power to keep my average speed above fifty-five miles per hour. 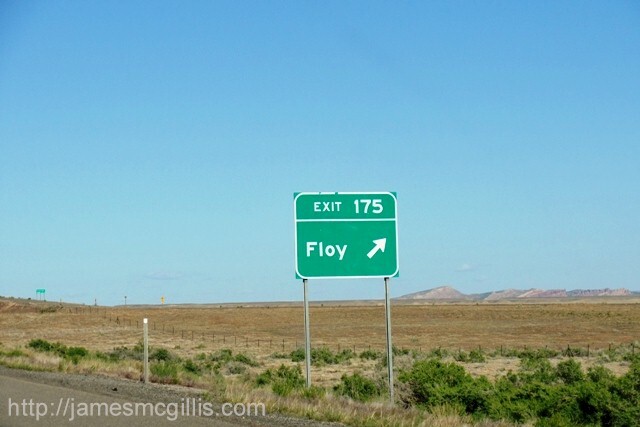 Another consideration was the hundred-mile distance to the next service station, in Green River, Utah. In case of emergency, I carry several gallons of gasoline in an approved container. I rarely have to use my reserve fuel, but it offers peace of mind when I visit remote locations. 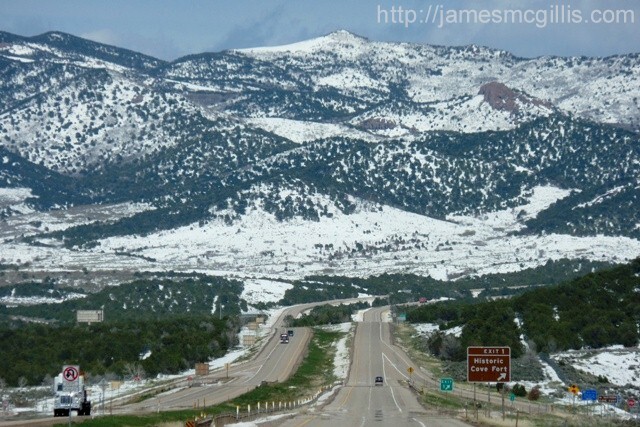 Once I reached Crescent Junction, I had only thirty-three miles to go on U.S. Highway 191 South. In Moab, my final destination was the Moab Rim Campark, at the south end of town. Before I reached Moab, I had a brief side trip to take. 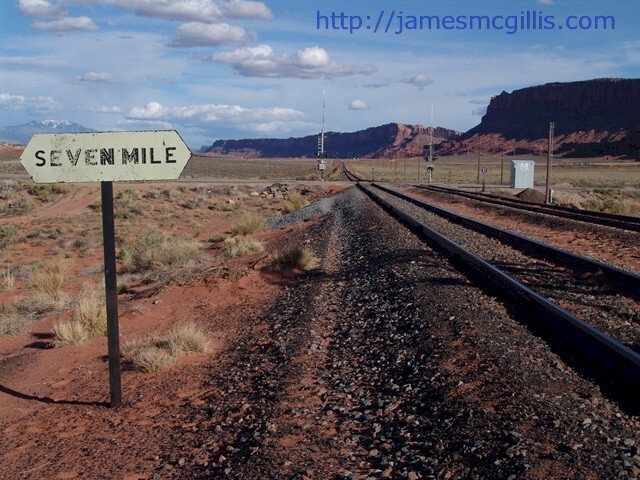 On a railroad siding near the turnoff to Utah Highway 313, I hoped to locate an old friend. Like an old-time prospector’s affection for his burro, I had become fond of the Moab Burro. 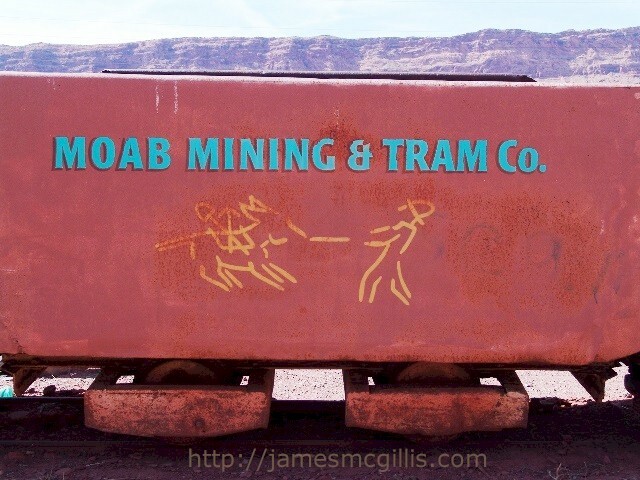 Although it is not an animal, the Moab Burro is a fascinating example of twentieth century railroad construction equipment. 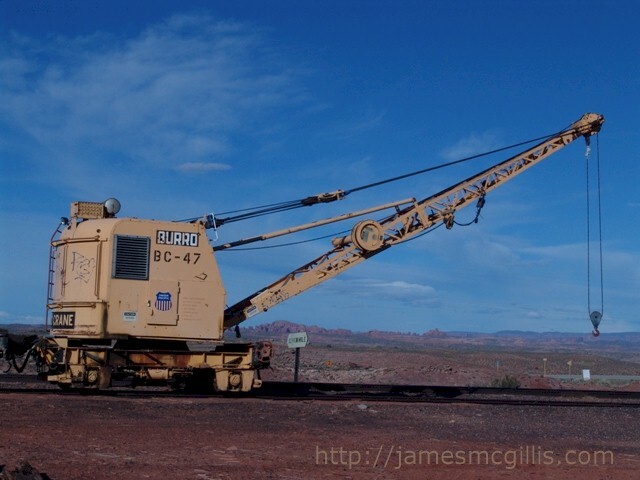 Built by the Cullen Friestadt Company, the Moab Burro is a self-propelled railroad crane capable of pulling other rail cars, lifting 12,500 pounds and swiveling on its turret 360 degrees. 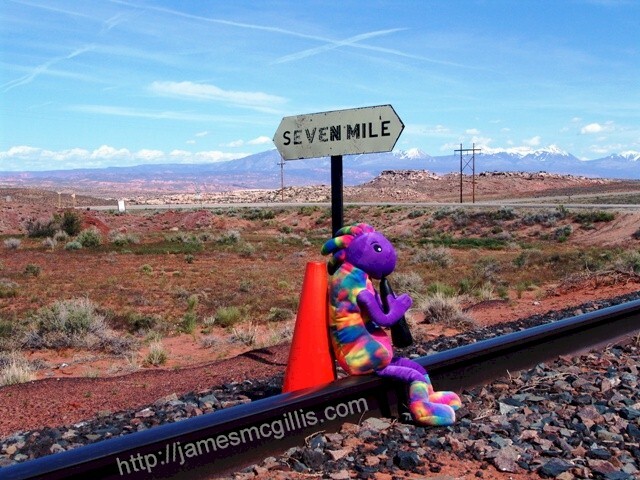 On my previous visit, the Moab Burro lay idle and alone on a railroad siding of the Union Pacific Railroad Potash Branch Line. 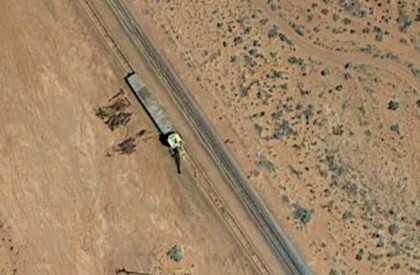 In fact, the crane and its flatcar-tender had been on that siding for so long, Google Maps had snapped its picture from space. That day, I was not so lucky. As I approached Seven Mile, I could see that both the Potash Branch Line and its siding lay deserted. Since the Moab Burro is a functioning piece of railroad maintenance-of-way equipment, Union Pacific Burro Crane No. BC-47 was probably elsewhere in the High Southwest. 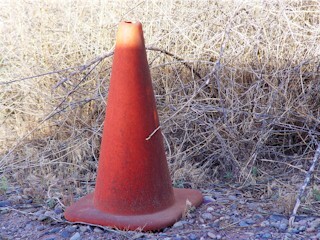 My hope of photographing Plush Kokopelli and Coney the Traffic Cone with the Moab Burro were dashed. Instead, I had to settle for pictures of my unlikely superheroes sitting on the empty track at Seven Mile. If any reader spots the Moab Burro elsewhere on the Union Pacific network, please take a photo and send it to me via email. If received here, I will then post any newly found images of Union Pacific BC-47, also known as the Moab Burro. After leaving Seven Mile, I headed straight for Moab. While crossing the Colorado River, I noted that it was flowing higher than it had in the past few years. If the increased flow originated in a heavy snow pack on the Western Slope of the Colorado Rockies, that could be a good sign for Colorado River health. If the flow came from a rapid snowmelt upstream, it might be just a “flash in the pan”, soon to subside. As it turned out, 2014 would be a good water flow year in the Upper Colorado River Basin. 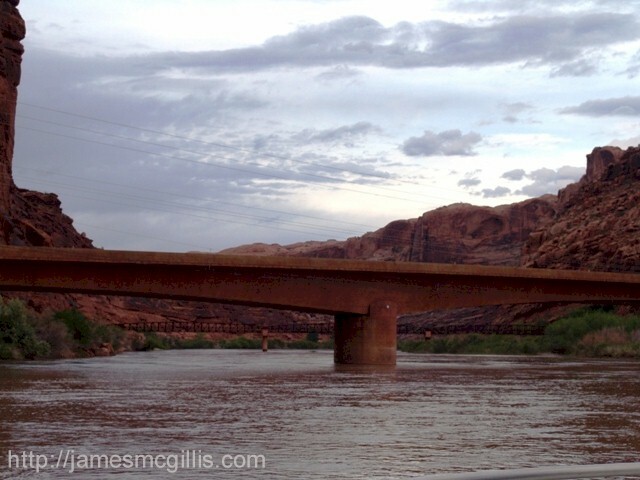 According to the USGS interactive website, on May 15, 2014, the Colorado River was flowing at about 10,000 cubic feet per minute (CFM) at Moab. By June 3, the river peaked at about 37,500 CFM, which was more than twice the sixty-three year average. 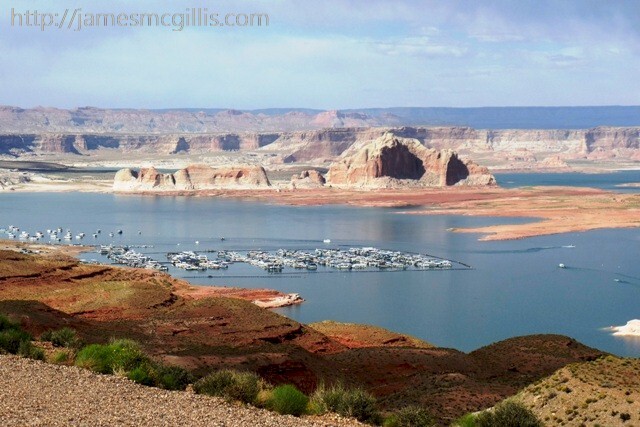 Downstream, Lake Powell reached its 2014 low of 3574' elevation around April 15. By July 10, 2014, the lake was peaking at 3,609' elevation. That rise of thirty-five feet put the lake level ten feet higher than on the same date in 2013. A six foot rise might not sound like much, but with Lake Powell's immense surface area, that represents almost an eight percent gain in water volume. As of July 10, 2014, the Lake Powell watershed had mixed statistics. The snow-pack was at forty-seven percent of normal and the total precipitation was at ninety-six percent of normal. A vigorous Monsoon in early July had added greatly to the total precipitation. Still, the lower mass of the snow-pack suggested lower flows for the remainder of the year. Soon after passing over the Colorado River, I saw a rare sight in Moab. As I waited at the Highway 128 stoplight, four identical 1960’s Shelby Cobra 289 sports cars pulled on to U.S. 191. From my vantage point, I could not see if the Cobras were original or if they were among the ubiquitous replicas manufactured over the past forty years. After snapping a picture of each Cobra, I followed them toward Moab. Soon, they pulled off for an early dinner at the venerable Sunset Grill. I wondered how the stiff suspension of each Cobra would fare on the long, washboard driveway that leads up to the restaurant. Soon, I arrived at the Moab Rim Campark, where I stay when in Moab. 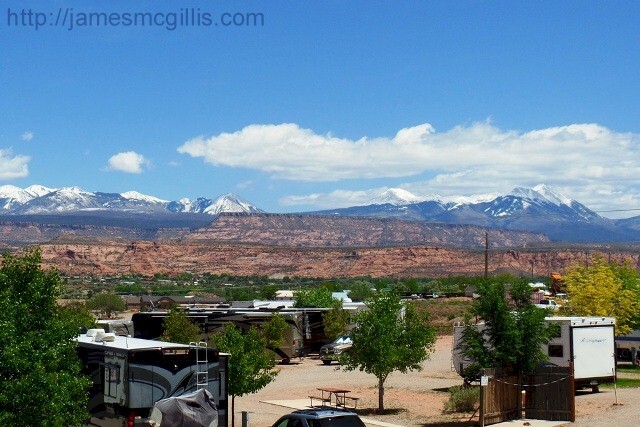 Owners Jim and Sue Farrell always offer old-fashioned Moab hospitality to all who stay there. As I pulled in to the RV Park, I noticed a young couple standing at the rear of their rental RV. 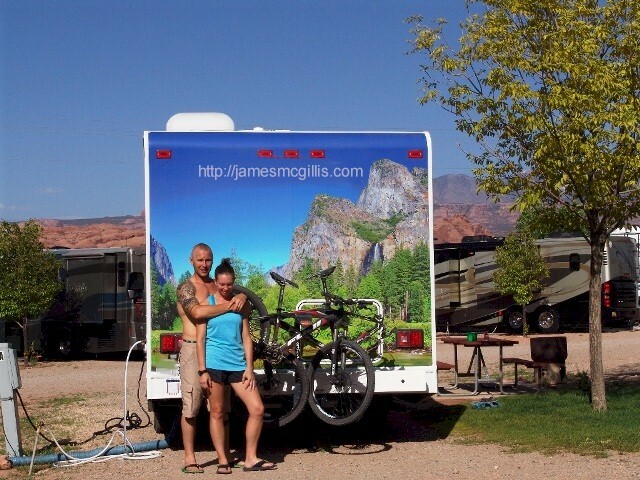 Emblazoned across the stern of their RV was a high definition image of Yosemite Valley. With their permission, I took several photos of the couple and the Sierra Nevada scene. As I shot the photos, I zoomed-out to show that they were in Moab, not in Yosemite. To see the full scene, please click on their image. Reflecting now on that meeting, I remembered that the young woman had looked up toward me and into the sun. She said, “I can’t see, so tell me when to smile”. Later, after examining the photos, I realized that the woman was blind. In my experience, blind people often see more of our universe than many sighted people can. I only wish I could have explained to her the double meaning created by their standing in front of the Sierra Nevada Range and Moab’s La Sal Range, all at the same time. 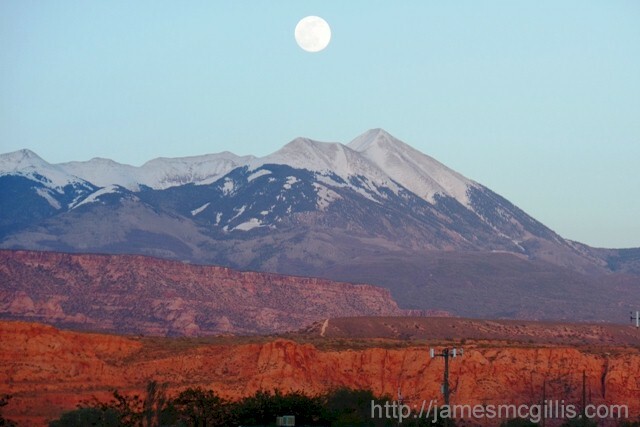 For years, I have witnessed and studied various dimensional anomalies in and around Moab. To witness a young blind woman standing in two places simultaneously was an event on par with witnessing a plasma flow etched across the morning sky in Moab. Smiling about my good fortune to witness such a sight that day, I realized that as of that moment, I was on Moab Time. 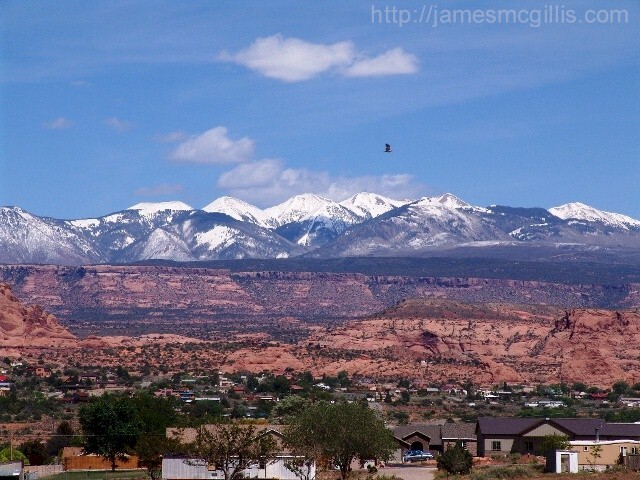 Returning from Yosemite to the Moab of my contemporaneous three-dimensional time-space reality (3DTSR), I looked beyond the young couple to the snowfields of the La Sal Range. Fresh snow, which fell only a day before my May 15 arrival dusted the lower slopes of the great mountain range. The brilliance of white snow against the blue sky was spectacular. Looking at my photos later on, I realized that one shot captured an image of a large bird of prey, frozen in time within that infinite sky. My first trip to Moab was in the summer of 1965. After leaving there, I assumed that it was a magical place, which I would never see again. Decades later, I read about the Moab Pile and its nuclear threat to life along the Colorado River. Upon returning to Moab in the early 2000’s, all of the magic and many new threats to the environment came to me. With Big Oil, Big Gas, Big Potash and Big Tar Sands all ganging up on Moab and Grand County, the soul of that magical place might easily be lost. During my current visit, I hoped to join others and sway Moab toward a more positive outcome. Copyright © 2016 Moablid.com. All rights reserved. Design by Savalas.net.